Injections are a fantastic treatment option for those looking for well-defined cheeks, firmer skin, and more volume. Over time, it is only natural to lose skin firmness, volume, and moisture as we age. However, we are able to change that thanks to innovations in technology. Many people who suffer from dull, thin, sunken skin suffer from low levels of hyaluronic acid, which is a substance that naturally exists in the cells of every single person’s body. Hyaluronic acid is what gives the skin a firm, smooth, youthful appearance. As we age, we start to lose hyaluronic acid, which impacts the look and feel of the skin. When there is not enough hyaluronic acid in the body, fine lines and wrinkles start to form. 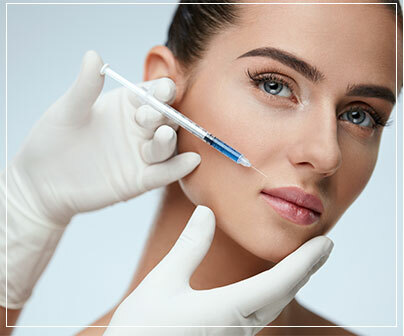 Perhaps the most popular skin injection out there, Botox is a prescription medicine that can be injected into the facial muscles in order to get rid of wrinkles, forehead lines, crow’s feet, and frown lines. Juvederm Vollure is a non-surgical injectable gel filler that is used to correct cheek and facial volume loss that has occurred because of age. This type of injection is ideal for individuals suffering from severe facial wrinkles and folds. Juvederm Ultra injections use hyaluronic acid and lidocaine to refresh and revitalize a patient’s appearance. This type of Juvederm injection is a thicker filler than others, making it ideal for moderate to severe volume loss. Juvederm Ultra Plus is very similar to Juvederm Ultra, except it can treat a larger particle size, which means it lasts longer than the Ultra version. In most cases the Ultra Plus lasts around 9-12 months. Juvederm Voluma XC is a cutting-edge injectable gel that leaves the skin looking just voluminous enough to create a youthful appearance. The gel is injected into the patient’s cheek in order to restore natural suppleness and healthier-looking skin. Juvederm XC is a thinner consistency than its Ultra and Voluma counterparts, making it ideal for individuals with a small amount of volume loss. Juvederm Volbella is a lip injection gel that aims to leave patients with the appearance of fuller lips. Characterized by a mixture of hyaluronic acid, this injection lasts up to a year, making it one of the best injectables on the market today. Kybella is another prescription medicine that is designed to improve the appearance of moderate to severe fat, namely below the chin. Also known as a double chin, Kybella is very effective in treating this area and restoring a more youthful, healthier appearance in patients.